Exhibited in the recent Global Caribbean Project, a piece by Eddy Firmin (known as Ano) made a critical statement about the environment of support for creativity in the Caribbean. The deep-hued pink workresembles what Ano refers to as a “piece of chewing gum” moulded into a sunken armchair, with an accompanying flattened foot stool. Its function as an object of support is questioned in this sinking, as though if encountered the sitter would also melt into oblivion.In addition, an acting footstool is positioned to the side of the armchair piece, as if to mock any attempt to rest up weary feet onto it. Threaded throughout, thebutton details of these pieces represent a certain luxury, suggesting the objects are made from leather rather than a cheaper material, and also giving an element of craftsmanship over industrial production. Stating it as being “synonymous with luxury living, rest, vacation” but“… far from humanity” Ano highlights this chair as a visual representation of Simon Njami’s Caribbean « comfort zone”,where the realities of Caribbean life are smothered under a mask of idealistic luxury living. The cut-throat economy that creates daily struggle generates an environment where a majority of Caribbean people are either swimming or sinking, and this extends to the state of contemporary Caribbean creativity as well. Because, for instance, the artworks that are most visible and widely promoted throughout the islands are those that embody this envisioned“comfort zone”. Neutral in content, pleasant to view, traditional in medium, these works and their artists arguably receive the most recognition and financial support in the region. It is the artists who push the boundaries of Caribbean representation, who express contestation, aggression, discomfort, that are fighting to swim. Another layer in the reading of this piece comes in the structure within the exhibition series, as well as its colour and form. For instance, is it a sculpture or an installation? Being situated in isolation, and having been easily transported, the natural conclusion would be sculpture. However, by exhibiting it in a Caribbean physicality, with the material giving the illusion of melting into the ground, arguably it becomes an installation. It changes the way the space is viewed, how it is encountered, especially by the Caribbean people it refers to in context. This fluid transition between two mediums in itself is also a challenge to the categorization of Ano’s work, and strengthens his negation of Caribbean art as needing to remain in the “comfort zone”. As well as being a symbol of wellbeing, the pink tone of the chair brings to mind the relationship between flesh and object. References can be drawn from previous works such as New Zealander Derrick Cherrie’s Retroflex(1988-1990). 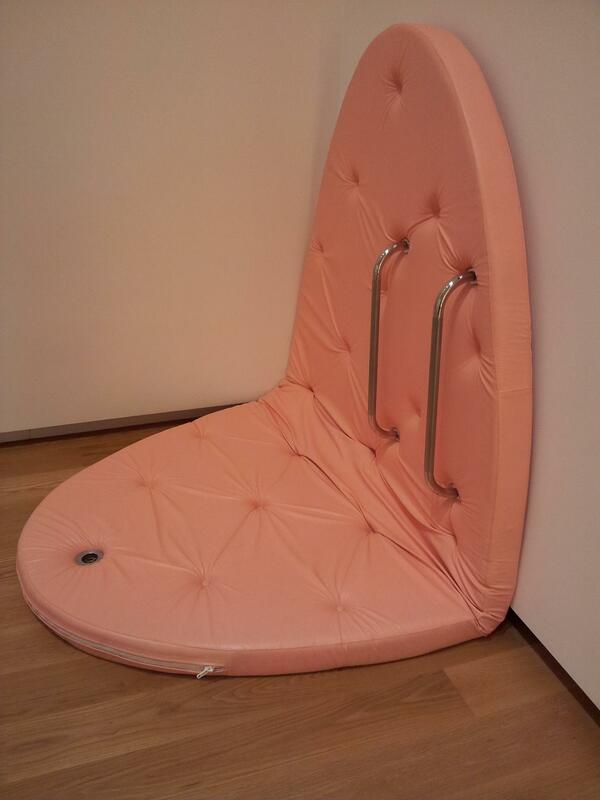 In this piece Cherrie deconstructs the representational functions of metal bars and a sink plug, which are embedded into a pink buttoned cushion not unlike the one portrayed in Ano’s work. They at once reflect physical activity and sterility, a bathroom or a swimming pool perhaps, and against the flesh like backdrop encourage a visual of open sexuality. This ambiguity of the piece being both something the body interacts with and parts of the body itself are seen similarly in Ano’s piece. Although his chair invites (well, almost dares, actually)viewer interaction, it also resembles flesh having been moulded into the present form. And in that aspect could be seen as a live organism fighting to swim, much like contemporary art in the Caribbean. So despite its cushy exterior, the connotations of Ano’s pink chair resound loud and hard in both art historical and social anthropological contexts. The transcending nature of its form allows various comments and readings to be communicated, which provides a rich dialogue on the (dis)comfort of the Caribbean environment. Dominique Brebion, Autour de global Caribbean, AICA SC web site https://aicasc.wordpress.com/2013/06/13/3080/translated by myself. Avec cette installation, Ano questionne le contexte d’émergence de la création dans les Départements d’Outre – mer ainsi que le positionnement de l’artiste caribéen au sein du contexte artistique international. Le fauteuil d’Ano, lové dans un environnement molletonné mais posé de guingois, est une métaphore de son inconfort dans l’acte de création en raison de l’histoire de l’art émergeante et de la tradition plastique non affirmée de sa région (2).